David Greene, host: A pretty ominous-sounding warning from North Korea this morning…. 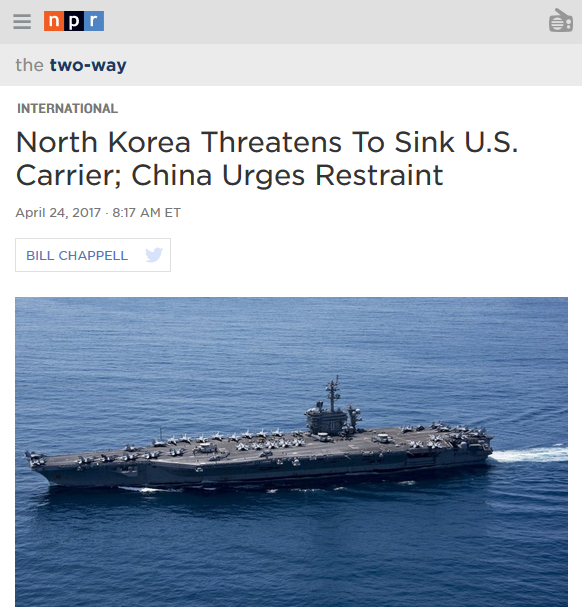 So what could North Korea actually do to threaten us?… I asked NPR national security editor Phil Ewing about the actual danger at this point from North Korea. Phil Ewing: So the danger is we know the North Koreans have ballistic missiles…. And we know they have nuclear weapons. They’ve detonated a number of bombs below ground in the past few years. The issue is, will they be able to build a nuclear weapon small enough to fit on top of one of those missiles to be able to threaten their neighbors—South Korea or Japan—or potentially even one day hit the United States? We don’t know if they’re there yet or not. The Pentagon says it has to assume they’re building toward that capability. And that’s why the generals and admirals, especially in the Pacific, pay so much attention to this danger. If North Korea’s warlike propaganda is so transparent, what should we think of the US media? Of course, professional journalists claim to pursue the truth, and report it in nobody’s interest but the public’s. But what if even a “serious” outlet like National Public Radio launches a flurry of fear-mongering at a word from the Pentagon? A survey of its coverage since March 8 suggests that NPR has promoted the perspective of the US government at the expense of public understanding of US/North Korean relations. The construction of foreign “threats” benefits both a national government hungry for legitimacy—and news organizations hungry for an audience. I think a lot of the danger comes from things that the United States might do, not things that North Korea might do…. What concerns me is the possibility that decision makers in the United States or elsewhere don’t understand that. One wishes that NPR reporters and their expert guests had gotten the memo much earlier. Since March, North Korea has been featured as an “urgent threat” (4/13/17), “a direct threat” and “growing threat” (guest expert Joel Wit, 4/17/17), a “real threat” (guest expert David Sanger, 3/29/17), “one big threat facing the US right now” (4/20/17), and a country that “has emerged as such a threat” (4/7/17). We have repeatedly been invited to imagine North Korea hitting the US mainland with a nuclear bomb (3/29/17, 4/2/17, 4/6/17, 4/14/17, 4/17/17, 4/20/17, 4/17/17). How likely is such a scenario? We contacted Bruce Cumings, professor of history at the University of Chicago and author of several books on Korea, who stated simply: “North Korea would never launch an ICBM against the US unless a general war was on; they know they would be erased if they did so.” By the time NPR’s April 24 segment aired, walking back the immediacy of the threat, NPRstaff and experts had conjured the nightmare scenario at least six times. The least likely of the many possible tragic outcomes has become the most likely to be remembered and feared by NPR listeners. In a Facebook Live interview (4/18/17), NPR national security editor Phil Ewing described US anxiety over Kim Jong Un’s birthday—when North Korea was expected to test a weapon: “People thought that he might attack…the United States.” Which people imagined such an improbable course of events? Ewing cited no source. Is his role to pass on the information he has turned up as a journalist—or is it to pass on a sense of fear, and an image of North Korea as aggressor? NPR‘s reporting feeds into a national confusion about US/North Korea relations, exaggerating the risk that North Korea poses to US Americans, and obscuring the real sources of that risk. 61 percent of Americans prefer increasing the already severe sanctions that are in place. Only 28 percent say they want to deal with the nuclear issue by engaging more and deepening ties with the country. NPR‘s coverage typically promotes a sense of murkiness about North Korea/US relations—we can sense the drama and importance, but it is often difficult to tell what is happening on the ground and why it is supposed to be so momentous. Impersonal phrases obscure who is acting, and often obscure NPR’s sources for their assertions. 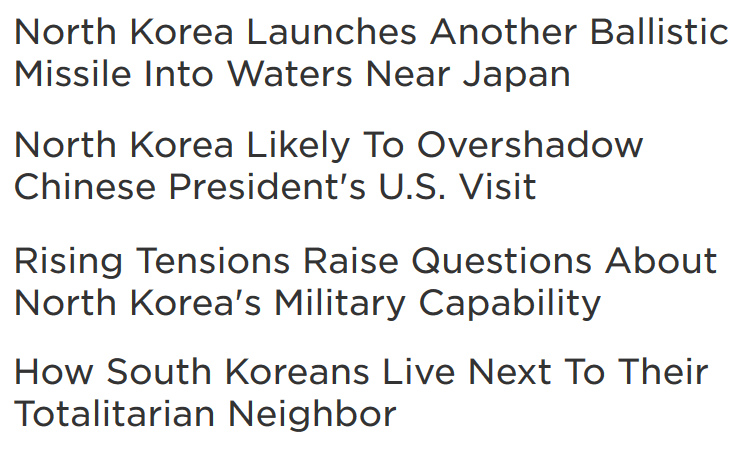 “Concerns” frequently “mount.”—or simply “there is concern.” One headline (4/14/17) read: “Rising Tensions Raise Questions About North Korea’s Military Capability.” Alternatively, tensions also “ratchet up” (4/25/17). Steve Inskeep, host: How tense is the situation here? Bob Schmitz, host: Oh, it’s tenser than it’s been in years. For whom are things so tense? 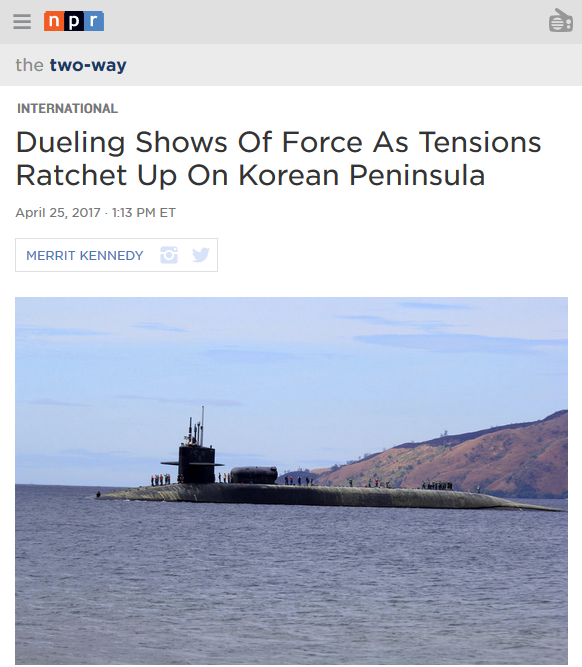 “Everyone in the region” was “feeling more tense than usual,” one piece (4/14/17) unhelpfully explained, adding: “Many people in the region are pretty worried.” Yet NPR (4/23/17) clarified that South Koreans are not particularly worried, quoting Korean author Suki Kim saying “North Korea is kind of old news” in the South. Still, in the 60 stories surveyed, NPR hosts and guests used the words “tense” or “tension” 46 times, as well as “concern” (as in worry) 19 times, and “worry” or “worrisome” 12 times, along with a variety of similar terms. Vague but agitating language allows NPR reporters to keep drama in their headlines, even when the subject of the story is something that didn’t happen—say, a nuclear test that there was “wide speculation” North Korea would carry out (The Two-Way, 4/24/17). And then yesterday, North Korea threatened to sink a US Navy strike group if provoked. The United States now is turning things up a notch. For their part, on the Today show yesterday, the UN ambassador, Nikki Haley, talked about the conditions under which the US might consider striking North Korea. David Greene: So is the vice president threatening war here? Joel Wit, US/Korea Institute: Well, I think what the vice president is doing is exactly what he said, which is showing resolve in the face of a growing North Korean nuclear threat. And if Americans are nervous that these tensions, you know, are there and want someone to step in, get some commitments from allies, somehow calm this down, Pence could be the guy. This is a big moment for him. Pence, whose father is a Korean War veteran, earlier visited the Demilitarized Zone between the Koreas, where he could see North Korean soldiers across the divide. The latter move is a perennial photo-op for US administrations, as Cumings described recently in an interview on a WNYC podcast (4/19/17). NPR chooses to include it naturally in the narrative, as if the carefully crafted government storyline was, in fact, the story. It’s unlikely that NPR reporters and editors want to come off as Pentagon mouthpieces, let alone as representatives of the Trump administration—of whom NPR is generally highly critical. NPR‘s North Korea coverage doesn’t give Trump a free pass—several stories point out that his aggressiveness and “unpredictability” could be making the situation worse. But coverage doesn’t challenge the tropes that help foster a compliant and supportive civilian population in wartime: the atmosphere of excitement and fear; heroic figures appearing amid the fog of war; the republication and amplification of official government statements; the dehumanization of the enemy. Part of the problem is NPR‘s consistent reliance on Pentagon and official sources: 40 out of 60 stories reviewed cited official governmental sources. For 14 of them, the US government was the only source. Many experts consulted are former government officials, or have close ties to government. NPR reporters are doubtless frustrated by the seeming necessity of taking so many cues from the Pentagon: in his interview with another NPR reporter about Trump’s armada lie, national security editor Phil Ewing was asked: “In your mind, there’s nothing the media can really do besides trusting what the Pentagon says,” and he responded: “That’s the discipline.” And though such reliance may be frustrating to NPR reporters, it’s downright harmful to the public that trusts them. The most salient point is that Americans (and NPR) never want to examine what their US Air Force did to North Korea in three years of bombing—essentially erasing 16 cities with nary a building standing in 1953, use of oceans of napalm, etc. Every North Korean is well aware of this. Through all the twists and turns of the narrative—the hypothetical attacks; the missile tests and military exercises that did or did not happen; the threats and responses—NPR has covered every inch of the present North Korea/US conflict, all while observing a remarkable silence about where the conflict comes from. Among all the stories posted to NPR.org, including all those from their flagship news programs, none mention US involvement in the Korean War as context for the current situation. The only such discussion we could locate through NPR.org was an interview with Cumings on the PRI/WNYCpodcast The Takeaway (4/18/17). The war in Korea has already almost destroyed that nation of 20,000,000 people. I have never seen such devastation. I have seen, I guess, as much blood and disaster as any living man, and it just curdled my stomach, the last time I was there. After I looked at that wreckage and those thousands of women and children and everything, I vomited. War leveled at least half of 18 of the North’s 22 major cities. Pyongyang, a city of half a million people before 1950, was said to have had only two buildings left intact. Inskeep: I just went back and counted. President Trump is the 13th American president to be dealing with this North Korean regime, the 13th…. Inskeep: …president in a row, a reminder of what a giant order that is to solve this problem. Up to now, for president after president, this has been a problem to manage, not solve. The latest launch comes as South Korea and the US wrap up their annual spring joint military exercises on the peninsula, which North Korea objects to because it views the drills as preparation for war. The US has consistently said the war games are defensive. Obama’s policy toward North Korea was, in point of fact, one of warfare…. The Obama administration [made] the militarization of the larger Asia-Pacific region one of its topmost foreign policy objectives. And under the Obama strategic pivot to the Asia/Pacific region, the US concentrated its naval forces to a tune of 60 percent…in the Pacific region…. The United States performs the largest war games in the world with its South Korean ally twice annually. And in the course of performing these military exercises, it actually rehearses a number of things. It rehearses the decapitation of the North Korean leadership, the invasion and occupation of North Korea, and it also performs a nuclear first strike against North Korea with dummy munitions. Why is NPR’s audience shielded from seeing what their own military does, and how it is perceived? And if you did start attacking North Korea, there’s a sense that they would start using those missiles. Twenty-five million people [the population of Seoul, South Korea] are at risk, as well as 33,000 US troops. It would be horrific. NPR reporters and their guests spoke often of the potential human cost of war; they mentioned the South Koreans and US Americans that might die in 11 out of the 60 articles surveyed. At each opportunity, however, they stopped short of mentioning the North Korean people who would die: They mention “casualties on both sides” only once (Weekend Edition, 3/18/17). To an outside observer, it’s obvious that North Korean media and government statements are not tools to inform, but to shore up political strength. In the United States, news outlets like NPR claim to be independent—and to inform, as much as possible, from an objective point of view. But the propaganda functions of news reporting are all the more effective for being subtle enough to go unnoticed by most listeners. NPR’s coverage of US/North Korea relations, while less sensationalist than that of many other media outlets, presents a skewed picture of the conflict, one which exaggerates the danger to the United States, mystifies the actions of US officials and the military, and erases North Korean victims of the conflict, both past and potential. You can contact NPR ombud Elizabeth Jensen via NPR’s contact form or viaTwitter: @EJensenNYC. Please remember that respectful communication is the most effective. This post originally ran on FAIR.org.